Send your email to Act at the above address or you can personally visit the place on the given address. Communicate with Act through the email address displayed above for any query, help, suggestion and feedback. Pick up your phone and call Act on the specified contact number. Let Us Know HERE if the provided contact numbers, email address or website of Act are invalid. Open www.acttv.in website and get all required information from there. Are You Satisfied After Making Call To Act? Established in 2000, ACT has been dedicated to provide state-of-the-art based entertainment, information and communication services in all the cities and towns of Tamil Nadu, Karnataka and Andhra Pradesh. ACT is officially known as Atria Convergence Technologies Pvt. Ltd. The company was founded by Sunder Raju, and it has been funded by India Value Fund Advisor since its inception. It provides services through following technologies Digital T.V, IPTV, Fiber-to-the-home Technology and Analog T.V. Currently, Atria Convergence Technologies Private Limited serves More Than one million users in its service area. The company's corporate headquarters are based in Bangalore, Karnataka, India. ACT customer assistance hours of operation: Monday to Friday: 09:30 AM to 06:30 PM, Saturday and Sunday closed. Being the popular triple play service provider, ACT has strong presence in Bangalore, Nellore, Vijayawada, Eluru, Indore, Chennai, etc. The head-office of ACT is located at Indian Express Building, No.1, 2nd Floor, Queen’s Road, Bangalore – 560 001, Karnataka, India. +91(080)-4284-0000 This number belongs to the headoffice of ACT remains available between the office timings that is 9:30 a.m. to 06:30 p.m., Monday to Friday. The contact person of ACT headquarters is Kiran Kumar S.
helpdesk@acttv.in If you have any concern or issues regarding the service of ACT you can directly to customer care department of ACT at this email address. 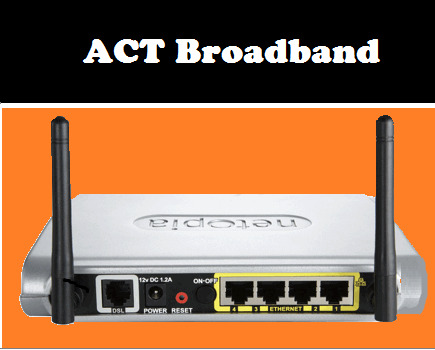 www.acttv.in Access here the official of ACT where you can get all the information related to the product and services of ACT like ACT Broadband, ACT Cable TV, ACT Broadband, etc. Here you will also get the information about ACT Partners, ACT Investors. Moreover. one can also pay his bill using the web-portal of ACT. For the region of Bangalore, ACT has separate ACT Regional Office. The address of ACT Regional Office and regional Nodal Officer is given Below. 08042840099 If you want to get information about how to get cable or broadband connection of ACT than this number may help you. Call at this number between the work hours. 08042840000 If you are already getting the services of ACT in any form and want to make complaint, suggestion can contact this number. 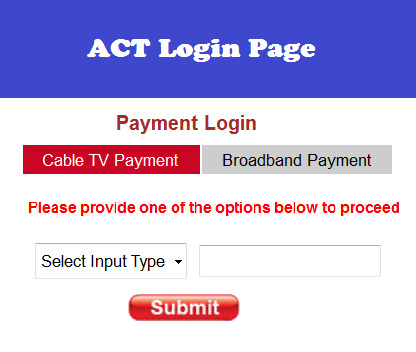 www.acttv.in/index.php/paybill You can pay your Act Broadband and Cable bill online referring this URL that is available on the web-portal of ACT. www.acttv.in/index.php/-administrator/current-openings Want to know career opportunity in ACT then follow this URL where you will be informed regarding the latest jobs in ACT. www.acttv.in/index.php/products/digital-tv If you are ACT Digital TV subscriber then follow this URL to check various features of digital television such as coverage, HD Tv Subscription, channel listing, etc. www.acttv.in/index.php/products/act-cable ACT Analog Television Subscribers can check channel listings, coverage and subscription of their Analog TV on above URL. www.acttv.in/index.php/products/act-iptv If you are ACT IPTV subscribers can follow this URl to check IPTV channel list and other services of IPTV. 0861 2301 999 For the customers of Nellore can dial this number for the all their queries, issues and problems between the office timings. 0866246450 If you are living in the region of Vijayawada and want make inquiry at this number about ACT. 0881 2245000 The Subscribers of Eluru can contact to customer care of ACT at this number. 044 2840 000 This is the ACT Customer care number for the Metro of Chennai region. 07314055 555 Call at this number to get connected with Indore customer care of ACT. Act resides at Indian Express Building, No.1, 2nd Floor, Queen’s Road, Bangalore – 560 001, Karnataka, India provides here all the necessory details like helpDesk helpline numbers i.e. +91(080)-4284-0000 by which customers can reach to Act easily. Here on this page you can get customer service toll free helpline number of Act. you can contact them by their email address helpdesk@acttv.in. 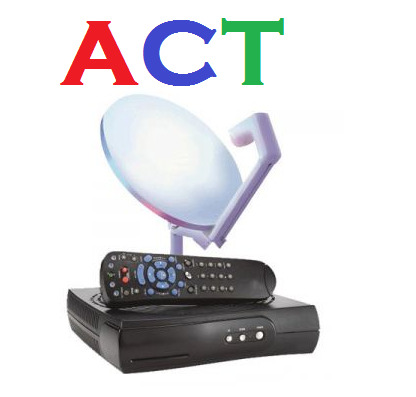 Go to Act website that is www.acttv.in and get more information from there.